Soft and chewy Nutella blondies are made with a buttery cookie base and topped off with ribbons of rich Nutella swirls! 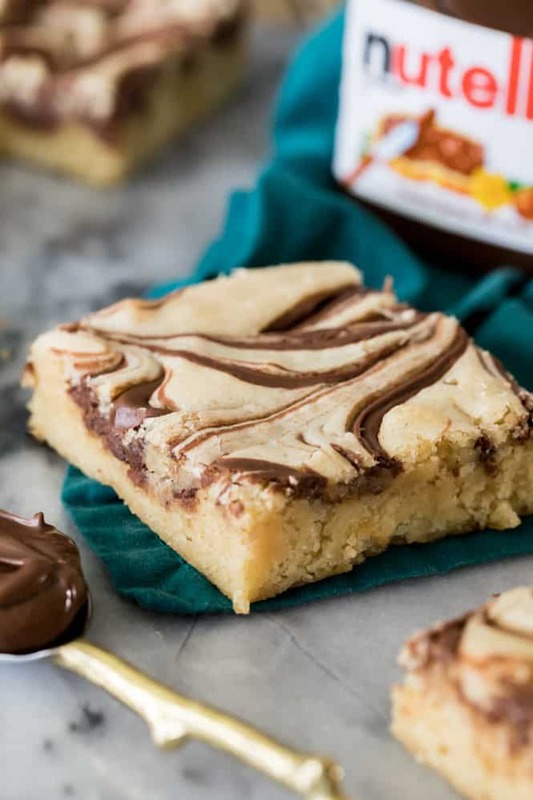 These cookie bars are so easy to make, and everyone who tries them is going to want the recipe! Hi everyone! Sam here from Sugar Spun Run with another sweet recipe to share! Today I brought Nutella Blondies! I’m not sure how it is in your house, but an open jar of Nutella in my pantry is bad news. No matter how much self control I think I have, I inevitably find myself with a spoon in hand standing over an empty jar, wondering how I got to this point in life. Again. So when my local grocery store had a sale a few weeks ago and I stocked up on five jars of Nutella, I knew that some emergency baking was in order so that I could use it up as quickly as possible. I spent a few jars perfecting my Nutella Cookies and then moved on to making these delicious Nutella Blondies. I adapted the blondie base from my favorite chocolate chip cookie recipe, and if you’d like to take the chocolate flavor up a notch you can drop a handful of milk chocolate or semisweet chips into the batter (I’d do no more than 3/4 cup in order to not overwhelm the Nutella flavor… these are Nutella blondies, after all). 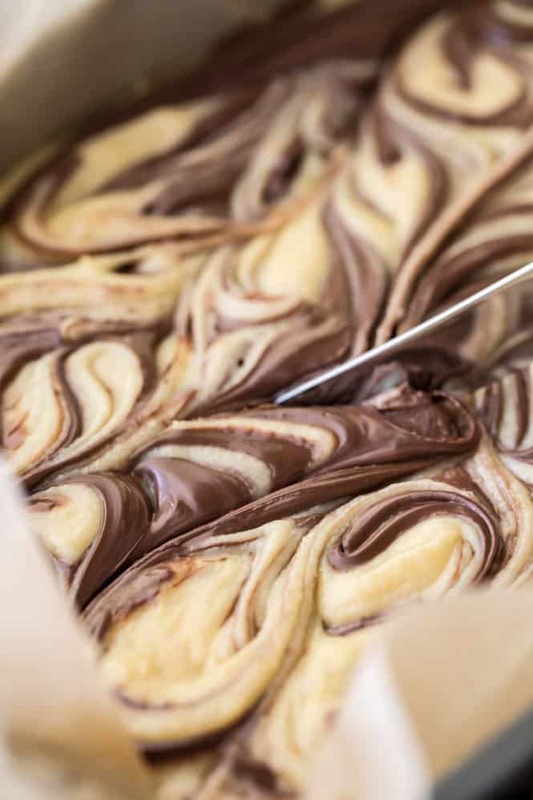 Once the batter is prepared, simply drop the Nutella by heaping spoonfuls over the batter and use a butterknife to swirl the chocolate/hazelnut spread through the blondie batter. 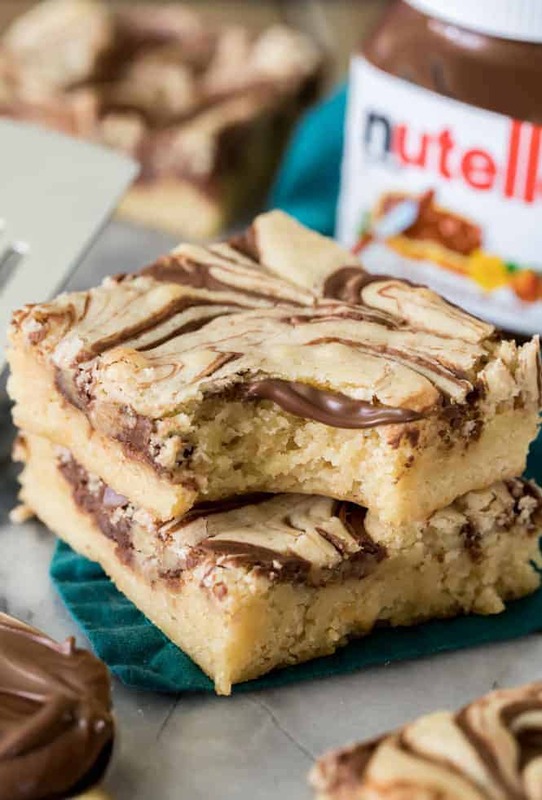 Soft, buttery Nutella blondies made with a chewy cookie base and plenty of rich Nutella swirls! These are easy to make and everyone loves them! Preheat oven to 350F and prepare a 9x13 baking pan by lining with parchment paper. Spread batter evenly into prepared pan and then drop your Nutella by spoonfuls over the batter. Use a butterknife to swirl the Nutella through the batter. Transfer to the oven and bake on 350F for 25 minutes or until edges just begin to turn golden brown and a toothpick inserted in the center comes out clean. Allow to cool before slicing and serving. Enjoy!